Our attention has been drawn to a story published by Ghanaweb.com and circulating on social media with the above caption. 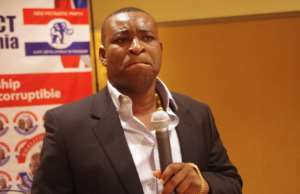 In the said publication, the Ashanti Regional Chairman of the NPP, Bernard Antwi-Bosiako, also known as ''Wuntumi'', speaking on ASH FM, said "President John Mahama is a corrupt thief just like his father, Mr. E.A Mahama, who was an Agric Minister in Nkrumah's administration''. In fact, Mr. Emmanuel Adama Mahama was the first person to be appointed Minister of Northern Ghana under Nkrumah and also served as an advisor to Dr. Hilla Limann, President of the 3rd Republic. At no point in his public life was he even investigated for the slightest form of corruption. So in the eye of right-thinking Ghanaians, he was a very selfless and incorruptible man who served his nation with distinction and dignity. And the illustrious feat his children(mainly John and Ibrahim Mahama have achieved in life) is a testament of his sterling qualities as a father. If we may ask; who is the father of Wontumi? We dare say that if Wontumi had a father as disciplined as E.A Mahama to guide his upbringing, he would never have turned out as clueless and ill-informed as he is. Again, we find his allegations of corruption against President Mahama as one of the usual baseless claims often made by operatives of this failing Akufo-Addo government against the impregnable reputation of President Mahama. As a matter of fact, Article 57(6) of the 1992 Constitution gives every succeeding gov't a grace period of 3 years to prosecute a Former Presidents who have engaged in one corrupt act or the other. Therefore, by 7th December 2020, President Mahama will not be legally immune from prosecution for so-called "acts of corruption " that the likes of Wontumi and others incessantly allege. We dare the NPP government to either follow through with the provisions in Article 57(6) or forever remain shut. Indeed, President Mahama will go down in history as one of the few Presidents in the fourth Republic to have shown a genuine commitment to the fight against corruption whilst in office. 1. The National Anti-corruption Action Plan(NACAP), which still remains Ghana's key blueprint in the fight Against corruption, was introduced. On the contrary, today we have a true defender of corruption as President, one who will go to great lengths to clear his errant appointees of corruption even in the face of compelling evidence to the contrary. Sadly, under the watch of Wontumi's mentor, President Akufo Addo, the Flagstaff House, which is supposed to be a fount of national honour, has been reduced to a citadel of corruption. This we believe should be a source of worry to Wontumi, if he could properly discern good governance. 1. 10 out of 13 secondary schools established by John Mahama in the Ashanti region alone (at Adugyama, Adobewora, Parkoso, Agric Nzema, Offinso Asuoso, Drobonso, Asante Akyem Banka, Oyoko, Adansi Fumso, Adansi Apedwa, Obuasi), etc have admitted more than 15,000 Asante students. Having won power through lies and deception, the Akufo Addo government is intimidated by the soaring popularity of Former President, and are prepared to employ devious and crude methods of character assassination. We, therefore, urge the public to treat such tantrums as those of Wontumi with the contempt they deserve. It is a sad narrative that today, the politics of Ghana, which has been the envy of other countries, has been cheapened to accommodate charlatans like Wuntomi. However, we wish to assure him that he will no longer have a field day to churn out his trademark reckless lies.